W. Don Baugher was born on October 20, 1938 in Senath, Missouri. He graduated from Senath High School and moved to Michigan in 1956. After serving two years in the U.S. Army, he went to work for the Whirlpool Corporation in Benton Harbor. He attended Lake Michigan College, and majored in Business Administration while working for Whirlpool. He continued to work for them for over thirty-nine years until he retired. He married Georgia “Jo” Bishop on September 23, 1961. They were blessed with two daughters. 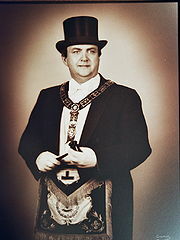 He was raised a Master Mason on March 25, 1963 in Lake Shore Lodge No. 298. He transferred to Coloma Lodge No. 162 where he served as Worshipful Master in 1978. He holds honorary memberships in Dearborn Lodge No. 172, Three Oaks Lodge No. 239, Lake City Lodge No. 408, St. Joseph Lodge No. 437 and Britannia No. 601, a Lodge he constituted when he was Grand Master. He served the Board of General Purposes for District No. 10, and served as Board President in 1984-1985. He is a member of the York Rite and holds memberships with the Calvin Britain Chapter No. 72, R.A.M. ; Nile Council No. 19, R. & S.M. ; Malta Commandery No. 44 and York Rite College No. 10. He is a member and Past Puissant Sovereign of St. Vincent Conclave, Red Cross of Constantine. He joined the Scottish Rite in the Valley of Grand Rapids in 1972 and was elected Class President. He has worked on the 4th, 8th, 23rd and 32nd degrees. He has held several offices in the Consistory and currently serves as First Lieutenant Commander of DeWitt Clinton Consistory. He crossed the hot sands of Saladin Temple, A.A.O.N.M.S., and served as Membership Chairman for District 1. He is a Past President of the Berrien County Shrine Club. He is a member of the Coloma Chapter No. 307, Order of the Eastern Star. He serves on the advisory Board of the Fidelity Rainbow Assembly No. 45 and is a State Official for the Michigan Grand Assembly and a member of the Grand Cross of Color. He is very involved with the National Masonic Foundation for Children. He has served on the NMFC Board of Directors since 1991, served at its President for four years and currently serves as Executive Director. 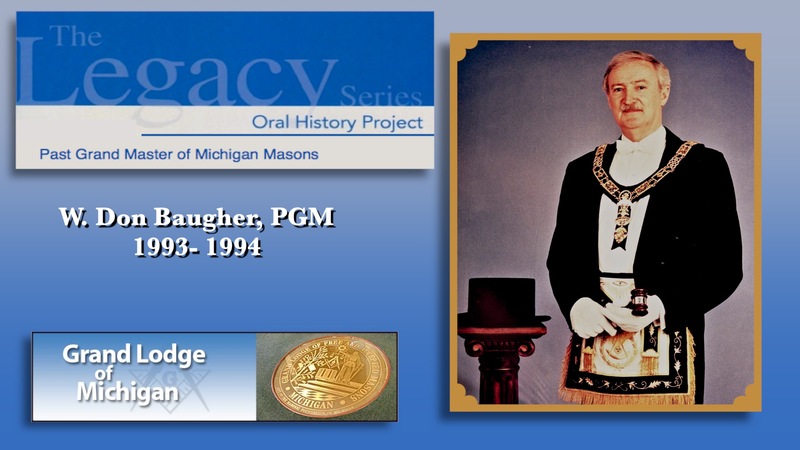 He was installed as the Most Worshipful Grand Master of Michigan Masons at the close of the Annual Communication of the Grand Lodge of Free and Accepted Masons on May 26, 1993. There were 77,000 Masons in 431 lodges in Michigan during his term of office. Henry A. Wilson, Jr. was born in Detroit on June 12, 1939. He attended Southeastern High School and received his Bachelor of Science degree in Biology and Genetics from Michigan Lutheran College in 1968. In 1978 he received a Masters of Art degree in Computer Science from the University of Detroit. He worked toward a Doctorate Degree in Education, Evaluation, Measurements and Research at Wayne State University. He was a partner and department head of the Management Advisory Services of Alexander Grant & Company, a national Certified Public Accounting firm. He met his wife, Mildred, while he was stationed in Stephenville, Newfoundland while in the United States Air Force. They married on June 17, 1962. He was raised as a Master Mason in Grosse Pointe Lodge No. 584 on February 18, 1972. Four years later he served his Lodge as Worshipful Master. In 1977, he was elected representative for District Three to the Board of General Purposes. The delegates at the 153rd Annual Communication elected him as Worshipful Grand Marshal in May 1978. In York Rite Masonry, he is a member of East Detroit Chapter No. 185, Royal Arch Masons, Jeremiah Council No. 88, R. & S.M., Highland Park Commandery No. 53, Knights Templar and Prince Edward York Rite College No. 8. In 1983, he was elected to receive the Order of the Purple Cross of York Rite Sovereign College of North America. He is also a holder of the Gold Cross Award of York Rite Colleges. In Scottish Rite Masonry, he is a member of the Valley of Detroit. He is Past Sovereign Prince, Carson Council, Princes of Jerusalem 1982-1983. He was coroneted a 33º Mason in Cleveland Ohio in 1985. He joined Moslem Temple A.A.O.N.M.S. in 1973, and served as a member of the Fraternal Relations Committee. In 1982, he was nominated for membership in the Detroit Court of the Royal Order of Jesters. In 1978, he joined the Ancient Accepted Scottish Rite Valley of Detroit where he was active in the portrayal of the dramatic degrees. He is also a member in the Lakeshore Chapter, Order of the Eastern Star in Grosse Pointe and Detroit, and the Downtown Hi-12 Club. He was named as an Honorary Member of the following Lodges: Harper Woods No. 585, Dearborn Lodge No. 172 and William M. Perrett Lodge No. 524. He also served as Treasurer and Junior Warden and as an usher, for St. Columbus Episcopal Church. He was also a member of the reorganization committee for Wayne County. During his term of office he Dedicated wings A & B of the Michigan Masonic Home on August 4, 1984. 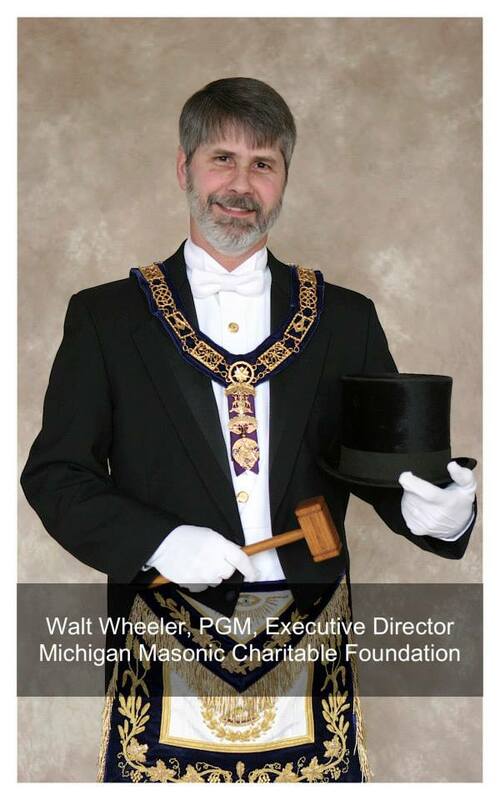 Most Worshipful Brother Walter F. Wheeler was elected Grand Master of Masons in Michigan at the 180th Annual Communication held at the Amway Grand Plaza hotel in Grand Rapids on May 24th, 2006.Walt was born on May 12, 1956 in Grand Rapids, Michigan, the only child of Dale and Helene Wheeler. Most Worshipful Brother Walt began his journey to the Grand Masters Chair as a member of Grand Rapids Chapter, Order of DeMolay which he joined in 1970. He served as Master Councilor in 1973 and District Master C ouncilor of District #4 in 1974. He is a holder of the Representative DeMolay Award, and the degree of Chevalier. He is a Past Commander of the Great Lakes Court of Chevaliers. He is an Active member of the DeMolay Legion of Honor. He was a member of Capital Priory, Order of Knighthood. Most Worshipful Brother Walt also serves on the Advisory Council of Grand Rapids Chapter, and is a Past Chairman. Brother Walt joined Grand River Lodge #34 (now Grand Rapids Lodge #34) in 1977. He& nbsp;served as Worshipful Master in 1985. He is a Past President of the Grand Rapids Past Masters Association and the Blue Lodge Board of Control. He also served for several years on the Grand Rapids Masonic Temple Association. He is an Honorary member of St. Albans Lodge #20, Kalamazoo-Anchor Lodge #22, Hastings Lodge #52, Buchanan Lodge #68, Livingston Lodge #76, Cornerstone Lodge #158, Middleville Lodge #231, Wabon Lodge #305, Doric Lodge #342, Lake City Lodge #408 and Montrose Lodge #428. Most Worshipful Brother&n bsp;Walt and his wife Vickie are members of Peninsular Chapter #65 Order of the Eastern Star. In the York Rite Most Worshipful brother Walt is a Past High Priest of Grand Rapids Chapter #7, Royal Arch Masons, and currently serves as an Officer in the Order of High Priesthood. He is a Past Commander of DeMolai Commandery #5 and a member of the Michigan Past Commanders Association. He is a member and Officer in Tyre Council #10, Royal and Select Masons. He is the Junior Warden of Mt. Moriah Council #128, Allied Masonic Degrees. He is also a member of West Michigan York Rite College #10, and St. Vincents Conclave, Red Cross of Constantine. He is a member of the Furniture City High Twelve Club, as well as Saladin Temple, Ancient Arabic Order Nobles of the Mystic Shrine. He is a member of Grand Rapids Court #11, Royal Order of Jesters. He is an honorary member of Moslem Shrine Temple. He is a Life Member of the&n bsp;George Washington Masonic National Memorial Association. He is a holder of the Order of Rainbow for Girls Grand Cross of Color. In the Scottish Rite he served as Sovereign Prince of Cyrus Council Princes of Jerusalem in 1994-95. He served as Commander-In-Chief of DeWitt Clinton Consistory in 2001-2002. He is currently an Officer in Moriah Lodge of Perfection. He was coroneted a 33rd degree mason in 1997 in Grand Rapids, Michigan. He has twice served as Chairman of the Board of Governors of the West Michigan 32nd degree Learning Center for Children. He has also twice served as President of the Board of Trustees of the Valley of Grand Rapids. He is a Past President of the Grand Rapids Scottish Rite Club, and a holder of the Valley’s Thespian Award, for distinguished service in the degree work of the Valley. Brother Walt married the former Vickie Reese in 1976. They met at a DeMolay Installation in 1972. At the time Vickie was a member of Job’s Daughters Bethel #67 in Grandville, Michigan. Vickie is a Past Honored Queen and also served in the Grand Bethel. Vickie and Walt have 3 sons, Andrew, Justin, and Tyler. They also have a Granddaughter Emma Grace who is the daughter of Andrew and his wife Sarah. Most Worshipful Brother Walt is a partner in Spectrum Lanes, a bowling center, Woody’s Pressbox, a restaurant and sports bar, Wheaton Enterprises, a real estate holding company, BA Northouse and Sons, a trucking company and Wheaton Digital Solutions, a computer company all located in Wyoming Michigan.